Faster product design cycles with modeling! Life Cycle Assessment (LCA) covers the whole life cycle of products, from raw materials acquisition to end use, recycling and disposal. LCA provides information to support decision-making in product and technology development projects. LCA based information is applied in eco-labelling and the production of environmental product declarations. The LCA approach can also be applied in the evaluation of eco-efficiency, material- and energy-efficiency, and eco-design and life cycle design. 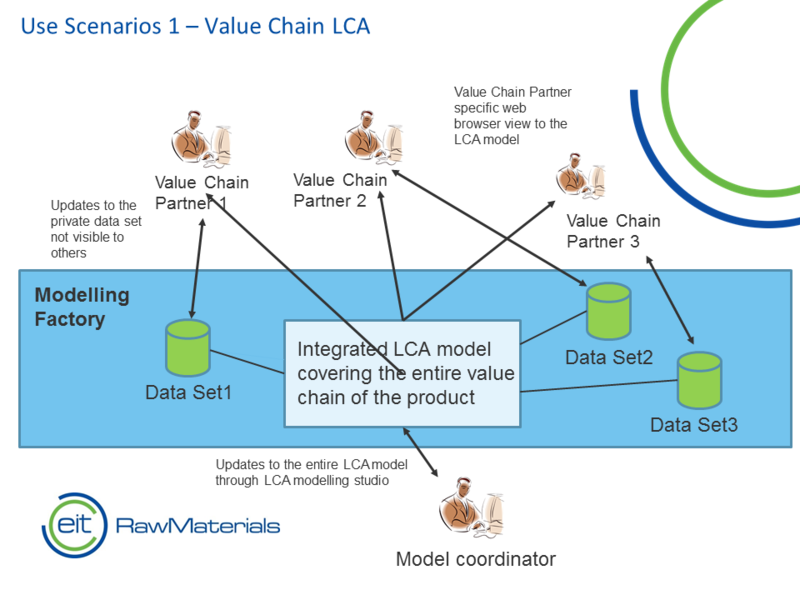 LCA modellers encounter often a data acquisition problem as different operators of a value chain related to a certain product do not want to provide company specific sensitive data to each other. However, all value chain operators would clearly benefit, if they were able to test how materials or production process changes can change their company specfic footprints as well as the aggregate footprints at the whole value chain level. Modelling Factory’s idea in this case is to hide the partner specific data from the other value chain partners, but provide a view to the overall value chain level aggregate results and predictions. The comprehensive model for the entire network of operators would be maintained and developed by one trusted body, called Model Coordinator in the adjacent figure. Link to Network LCA cloud service - Try it! M&S driven materials design based on Integrated Computational Materials Engineering (ICME) is arising as an approach to discover and deploy performance tailored novel material solutions meeting specific functionality profiles. Use of ICME in systematically seeking material solutions comprising of available raw materials incorporating constraints of substitution and the circular economy. ICME involves multiscale modelling and the use of computationally demanding high performance computing (HPC) resources to derive databases consisting of material processing, structure, property and performance information to be exploited by materials engineers. The HPC results can arise from various sources – first principles computations, mesoscale models, phase fields, thermodynamic and kinetic modelling etc. HPC generated data and fast-to-compute surrogate versions of the underlying computationally costly materials models are especially supported by the Modeling Factory infrastructure. 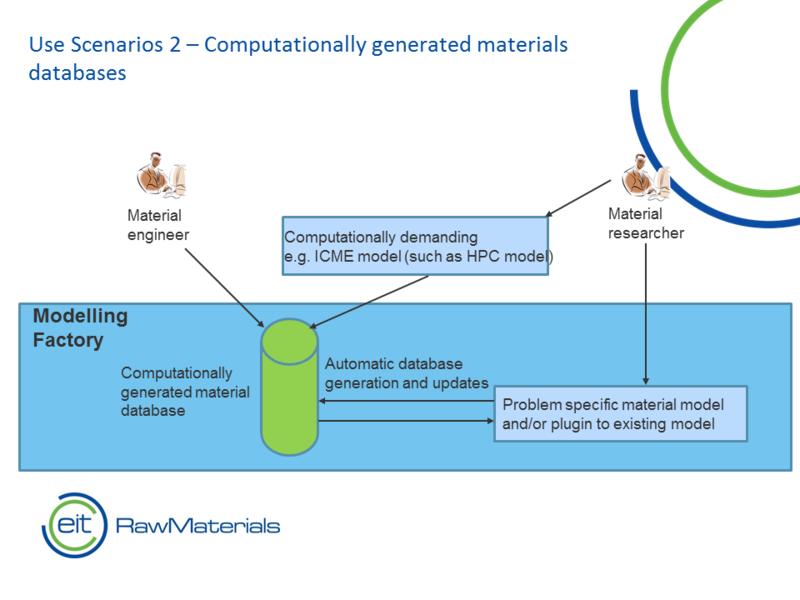 The idea of use case 2 is to provide materials engineers tools for simulation model integration, computational database generation and statistical data analysis to study novel material solutions with product specific functionality requirements. 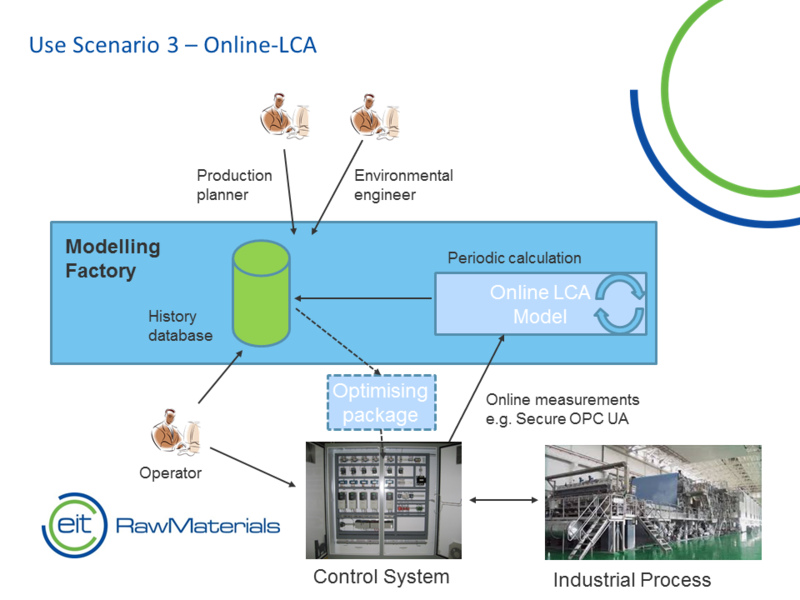 The Online LCA model will provide a framework for LCA calculations based on industrial process data and will serve as a show-case on how real-time LCA calculations can benefit industrial production planning and operation. Industrial processes use vast amounts of resources such as energy and raw material. Process modelling is a well-known tool to increase the process efficiency and to reduce the process resource consumption while keeping the processed product within the given specifications. Further knowledge can be added to standard process models by including LCA calculations for the model domain giving the production planner and operator information on environmental impacts during planning or in real-time during production. When considering raw material use, there is often a trade-off between environmentally preferable materials and economic cost. Therefore, the possibility to link raw time dependent material price data to the model could give even more relevant information from a production planning point of view. Taking this concept even further would be to use the process models in an optimisation algorithm to minimize environmental impact during production, constrained by quality specifications and process parameter boundaries.